A perfect blend of form and function, accent benches may be the most versatile item in the home. While benches can be practical pieces, they can mean much more to the design and visual appeal to a variety of spaces. They work style and function wonders in foyers, halls, landings, and mud rooms. They look great at the foot of the bed, or as a soft coffee table. Place in front of a picture window for an instant window seat, or in a large master bath. Bedroom benches mean comfort and convenience, and style. We have more 800 fabrics and 50 leathers for your next bench. Give it a designer’s touch with nail head trim, or button tufting, or a unique wood finish. With so many Bassett store locations, you’re sure to find one in your neighborhood. Stop by and browse our latest collection of benches, chairs and other seating. Find the perfect bench for your bedroom or create it with the help of one of our expert design consultants. 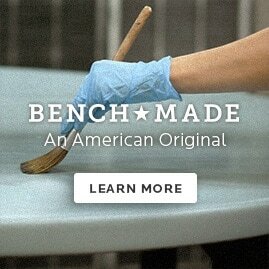 Together, we’ll create the dining or living room benches you’ve always wanted.